Last week we got twenty inches of snow. TWENTY inches. Unreal for this region. We are still digging out. The boys like twenty inches of snow a lot more than me. Meanwhile, I did get a nice sunshine style surprise in the mail recently. It made the fact that I can't seem to get my car down the driveway through the trenches of snow somewhat more bearable. Some Clif Kid Zfruits with veggies, in an adorable reusable planter. It's their newest organic fruit and veggie snack, full of Vitamin C and fiber, and my boys dove into them. I'm lucky I had time to snap this picture. I just love these portable, healthy, and tasty snacks. Disclaimer: I was sent some Zfruit to sample for review purposes. The opinions above are my own. Love that cute little planter. I'd like to try all the flavors. Hi Lisa I bet Mattie would love to try these. Hi Lisa I bet Mattie would love to try these! I have seen Cliff Bars in stores, but never the fruit and vegetable ones. Great way to get kids eating their veggies. DH loves regular Clif bars, but I really want Clif to bring back the Clif Shot Roks. Those were perfect for summer cycling. My nieces and nephews will love these!!! And healthy too!! I would love to try the Clif Kid ZBar. I'm sure my kids would love all of them! 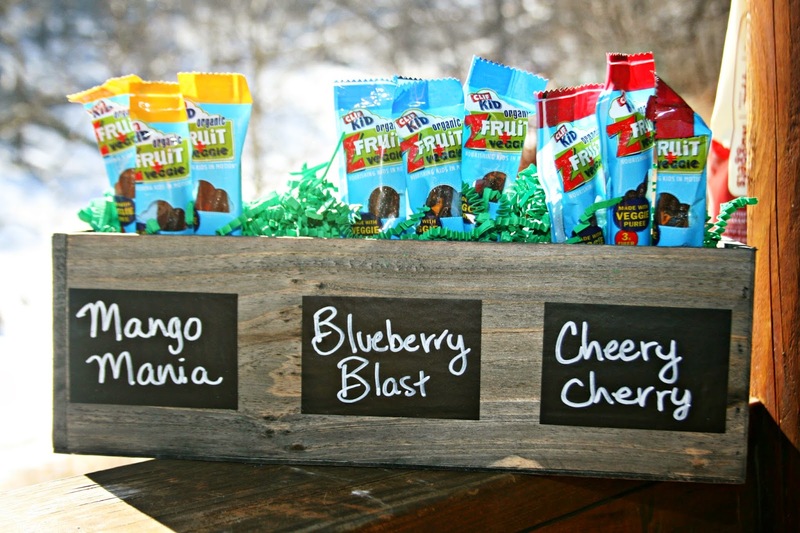 Mr. L loves his Clif bars and I love portable fruit snack anything, especially if organic - these sound so good! TWENTY inches?!?! Bless your aching back. We're due for another 7 today. Right now the snow depth is at 20 inches. It seems like an unusual winter in so many ways. that is really cute. hope it lands in good hands! I don't know about cliff bars, but I can't wait for basil and mint in my planter! These sound good. I like Clif bars. Those look like something that would be a good addition to the long term food storage supplies. The snow is off the trail and the roads here, huzzah! I got out yesterday and went to town. I hope it melts off there quickly. Be careful driving. Wow, 20 inches is a lot of snow! We got about 14, but the weather warmed up so the roads were clear the next day. The blueberry blast sounds so good! Thanks for the awesome giveaway. I hope your snow melts soon! wow such a nice post. wonderful blog here! great work! I'd like to try Kit's Organic nut and fruit bars, especially the chocolate, almond, coconut flavor. I'd like to try the Kit's Organic peanut butter fruit & nut bar. What a fun thing to get in the mail in the middle all that snow! Looks like a little box of springtime. I've never tried the CLIF Crunch Bars. The peanut butter sounds delish! One I'd like to try that I haven't had is Maple Nut. I'm a big Clif fan. That sounds like a nice surprise and it's healthy too! i would like to try all of their clif kit's organics food bars. 20 inches of snow is great...when you are a kid. But that is about all. I hope you all enjoyed it...but that it melts soon! And it looks like fun! I would like the mango mania! I love the coconut chocolate chip bar! Yummy! Shot Energy Gel would be great to try. I love the traditional clif bars, and really like the clif mojo bars. I like the Clif Mojo Sweet & Salty Dipped S'mores Bar. Condolences on the 20 inches of snow. That's a bit much, even up here. I trust you had enough groceries on hand, along with the Clif treats. I'd like to try the Clif Shot for when I go running. I am signed up for a half-marathon, so I had better start training now! I think my kids would like the berry almond bars. All of them look good to me. I love the Clif Builders Chocolate Mint bar! Yum! My son is addicted to all things strawberry and I know he'd love these fruit ropes. I would Love to try the blueberry blast. I would like to try the macadamia nut bars! The Cliff Mojo mixed nuts bar looks yummy! That's a lot of snow! Cherry almond bars look great. I'd love to try the KIT'S organic bars with my kiddos. The chocolate and coconut Luna bar sounds good! The blueberry blast would be a hit at our house. i would also love the CLIF CRUNCH Granola Bar. I haven't had Luna bars in years but I might pick up a carrot cake bar at the grocery store since it sounds so yummy. I'd love to try the coconut chocolate chip cliff bar! I've enjoyed all the clif bars I've ever tried--so tasty and nutritious and filling! I'd really like to try the zfruit ropes!